Register by Monday, February 27; See Flyer for details. Join us in welcoming Dr. Raul Cabrera, our new Nursery Crops Extension Specialist based at RAREC. Just a Bud or Another Bug? Unfortunately, this one is another bug. The pine sawfly is normally kept under control by natural predators so I rarely see them. This, however, was my second sighting in the last 4 months so I guess environmental conditions have not be optimal for predator survival. Keep a lookout for these insects. 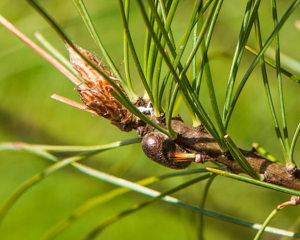 The larvae are voracious eaters that completely devour the needles and can totally defoliate pine trees. The first site I visited had a block of about 25 trees more than 20 feet tall that were without needles.